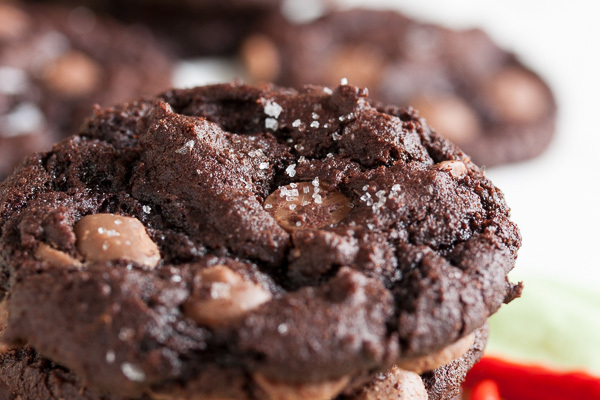 Chocolate Diablo Cookies | wanna come with? We in Vancouver will say we’re on the west coast – and we are, we’re totally a port city. But when we look west, we don’t see open ocean. We see Vancouver Island. The other side of the island is the true west coast. That’s where you’ll find the beautiful Long Beach and fishing villages and lots of little surf spots. And it’s home to Mexican food truck Tacofino, named after both the town of Tofino and the delicious delicious tacos the truck is best known for. They’ve since branched out, with both food trucks and sit-down restaurants in Vancouver and elsewhere in the province. And I consider myself so, so lucky that I work near one of their food truck locations and when I’m craving good Mexican food, I can enjoy a fish taco (or 2) for lunch pretty much any time I want. Followed by one of their Diablo Cookies for dessert, of course. Seriously, decadently good. Also lucky for me, Tacofino was featured on Eat Street a while ago, and they graciously provided their cookie recipe to be posted on the Food Network website. Happy day! So I’ve been meaning to make these cookies for ages. Just last week I was totally waffling between this recipe and the gingersnaps I ended up making. And the day I brought the gingersnaps in, one of my coworkers actually made a request for the Diablo cookie. Outta nowhere. Spooooooky coincidence right? But that sealed it. I definitely had to make these cookies next. 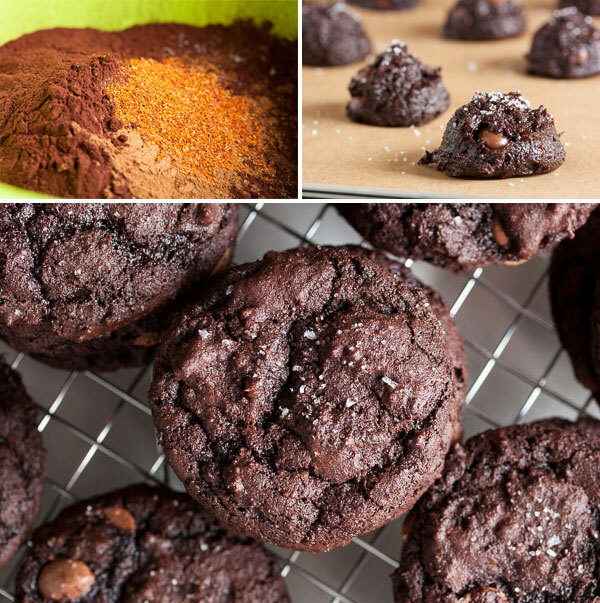 I’ve made similar cookies in the past – commonly called Mexican Hot Chocolate Cookies – and they’re definitely good, but none of the ones I’ve tried have the same punch of flavour that these cookies do. 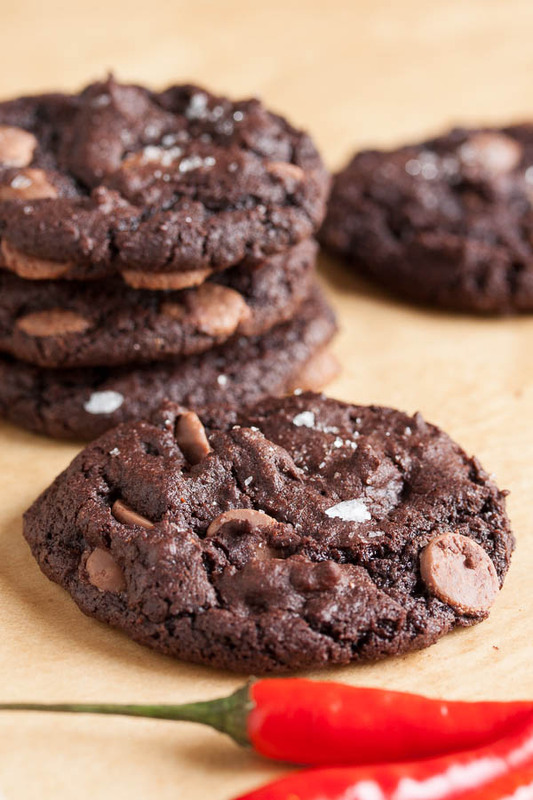 While the official recipe online includes plain chocolate chips, every time I’ve had Tacofino’s cookies they’ve had big chunks of milk chocolate in them. One of my favourite cookies is a combination of ginger and dark chocolate, so I’m sure they’d be fantastic either way, but for that extra contrast between sweet and spicy, I decided to go with milk chocolate chips. I think it was the right decision. I don’t know how true this recipe is to the one they actually use in-house (I’m sure it’s been simplified and scaled down for home cooks), but the cookies ended up tasting just like the ones they sell on the truck. 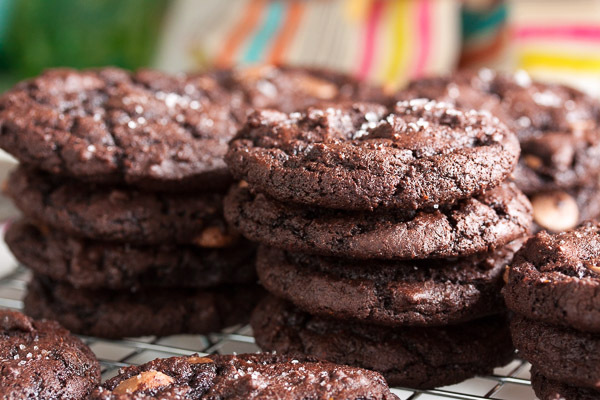 Soft and dense and moist and fudge-y, more like a brownie than a cookie. With heat from both the fresh ginger and the cayenne pepper, balanced by the sweet milk chocolate. This is a good cookie. Fun story – I usually just use a vegetable peeler to peel ginger, but I’ve been reading about how a spoon will do a better job, so I gave it a shot! And? Ended up with ginger juice squirted right into my eye. Ow. Never again. 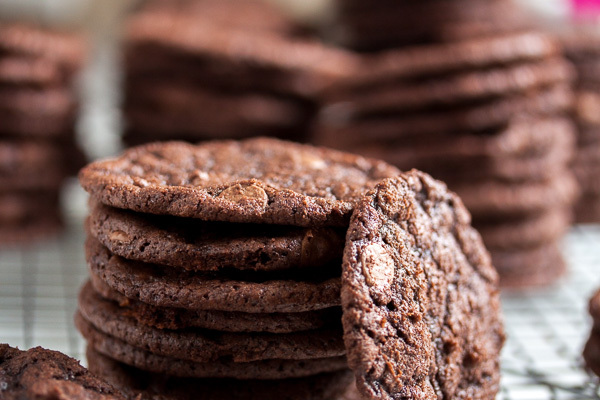 Adapted from Tacofino's Chocolate Diablo Cookies recipe on The Food Network. The original recipe says it will make 12 big cookies using fist-sized balls of dough (wow), but I used my usual tablespoon-sized scoop and got 56 smaller cookies. 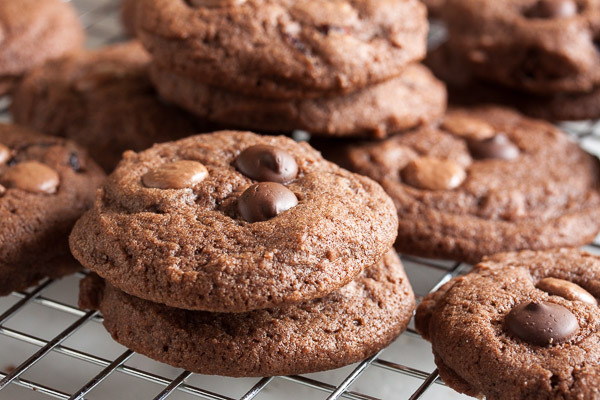 All the chocolate flavour in this cookie comes from cocoa powder, so be sure to use a good one. In a medium bowl, whisk together the flour, cocoa powder, baking soda, cinnamon, and cayenne pepper. Set aside. In a large bowl, or in the bowl of a stand mixer fitted with the paddle attachment, beat the oil and sugars together on medium speed until well-combined. Scrape down the sides of the bowl and add the eggs, one at a time, beating well after each. Add the vanilla and grated ginger, and beat again to incorporate. Turn the mixer down to low and add the dry ingredients, mixing until just barely combined. Remove from the mixer and add in the milk chocolate chips either with a spatula or by hand. I prefer to knead inclusions in by hand to ensure they're distributed evenly, but this dough is soft enough that a spatula will work fine. Using a small cookie dough scoop or by forming the dough into small balls, portion the dough onto the baking sheets about 2 inches apart to allow for spreading. Sprinkle each with a bit of salt, and then a more generous sprinkling of sugar. Bake for about 11 minutes, until the tops begin to crack, rotating the baking sheet halfway through the baking time. Allow to cool on a wire rack for a few minutes before removing the cookies from the pan and allowing them to cool completely. The centres should be soft and fudge-y and gooey. Mm mm mm. These look so delicious! Does the 1 tsp of cayenne make it pretty spicy? Hi Lauren! Hard to say – everyone has a different idea of what’s “spicy”, right? 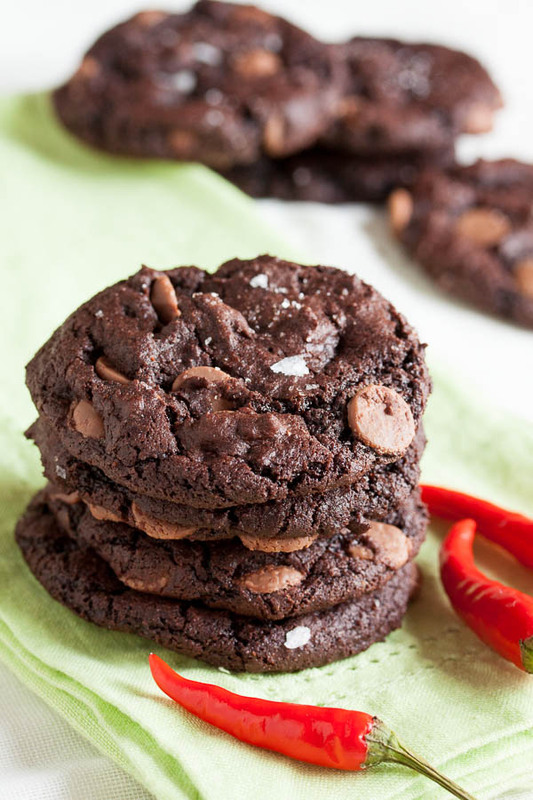 I generally like spicy foods, and I could definitely taste the spice in these cookies. I didn’t hear anyone complaining that they were *too* spicy though. And don’t forget that in addition to the 1 tsp of cayenne, there are THREE TABLESPOONS of fresh ginger – and that adds a lot of heat on its own. Oh my gosh those look AMAZING!! I so miss living near good Mexican food places…I guess I’ll just have to console myself with some of these cookies 😛 Thanks for sharing the recipe! I love love love spicy baked goods! Pinning this one and trying it the next time I bake cookies! Thanks! These cookies look and sound pretty delicious. 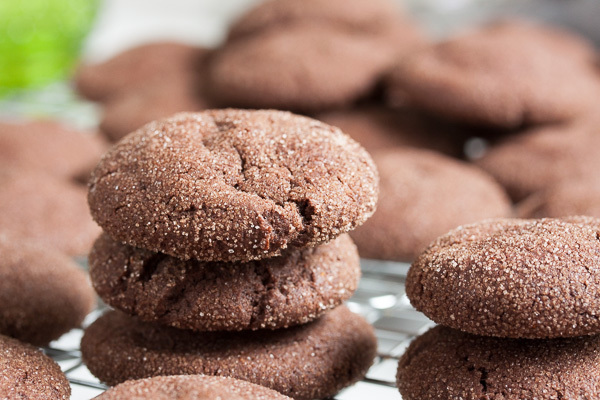 I love spicy-chocolat-y baking so I wish I had one of these now! I’ve made these before with fresh ginger and they were amazing! How much ground ginger would you use to substitute for the fresh? That’s all I have on hand and my girls are desperately wanting to make some cookies. Thanks! Thanks! I ended up using a full teaspoon. The cookies were still pretty good. Maybe slightly lacking in gingeriness, but still really good!